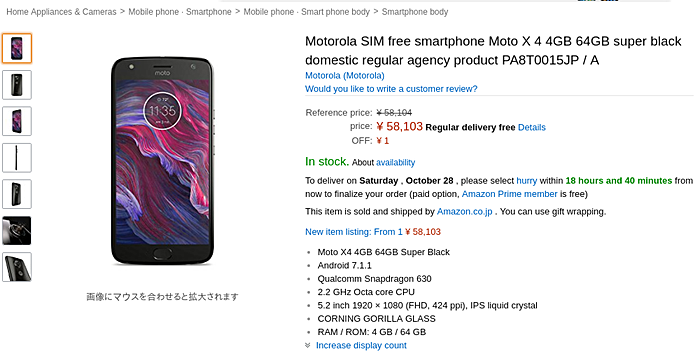 The Motorola Moto X4 is now available in Japan. The device is listed on Amazon Japan for JPY 58,103, or $510. Shipments are set to begin tomorrow, or October 28. The handset made its debut back in August at this year's IFA conference, with Europe becoming the first market to get it. The next country to get the Moto X4 will likely be India, where the phone is expected to go on sale November 13 onwards. They certainly love the iPhone and it's manufactured primarily in China. and you dump it for 3 months, Motorola is known foe quality not quantity... and sorry Japanese don't care much a products that originally came from china. Go For MI , You can get same specification in Half price.